Set fixare distribuţie FIAT, IVECO, FORD, Citroen, Peugeot - PSA, 2.2L，2.3L，3.0L. - ZR-36ETTS92 - ZIMBER - ZIMBER. For engine 2.2L，2.3L，3.0L. Car models：new Fiat Ducato,Iveco Dayli,Ford Transit Van,Peugeot Boxer,Citroen Jumper equipped with these motors. Car models：new Fiat Ducato,Iveco Dayli,Ford Transit Van,Peugeot Boxer,Citroen Jumper equipped with these motors. Trusa de Fixare Distributie FIAT,LANCIA, OPEL,SUZUKI, HYUNDAI,MITSUBISHI 1,3 JTD Diesel - ZIMBER TOOLS. Trusa de Fixare Distributie Fiat 1.7D/1.7TD 1.9D/1.9TD, ZL-7225 - ZIMBER TOOLS. Set fixare distributie Fiat, Lancia, 1.6 16V , ZR-36ETTS75 - ZIMBER TOOLS. Set fixare distributie Fiat 1.2 ,16- supape (ZT-04815) - SMANN TOOLS. Set fixare distributie Fiat, Lancia, 1.6 16V - Belt Drive - ZR-36ETTS156 - ZIMBER TOOLS. Set fixare distributie Fiat, Alfa Romeo, Vauxhall / Opel 1.4 16V, 1.6 16V 1.8 16V, ZR-36ETTS185 - ZIMBER TOOLS. 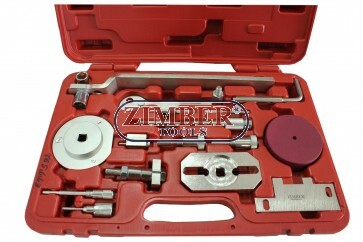 Set Fixare Distributie Fiat 1.4 12V, ZR-36ETTS190 - ZIMBER TOOLS. Set fixare distribuţie OpeL,Fiat, Alfa Romeo, Suzuki,Saab 1.3, 1.9. 2.4 D, DT, CDTI, ZT-04173 - SMANN TOOLS.